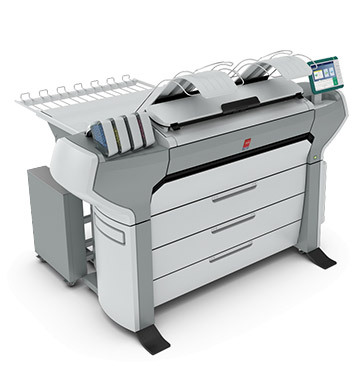 225 D size prints/1,389 sq/ft per hour. 11″ to 42′ media roll width. Capacity of 6 rolls, up to 13,650 sq. feet of media online. Expand your services cost effectively with Océ MediaSense technology’s ability to print on thicker media up to 32mil thick..
Grow your application range with media versatility for posters, roll up banners, disposable POP canvas, wallpaper etc. Increase your efficiency with multiple finishing options including stacking and folding.